Views on the world to share: Sapere Aude ! Why to debate Geoethics ? Geoethics consists of research and reflection on the values that underpin appropriate behaviours and practices, wherever human activities interact with the geosphere. Geoethics deals with the ethical, social and cultural implications of Geosciences education, research and practice and with the responsibility of geoscientists in conducting their professional activities. Geoscientists play a fundamental role in society, given their unique range of skills, by helping to meet human needs and address problems of relevance at the local and global scale, and by providing information and expert advice to support informed decision-making and public debate. Geoscientific discourse is increasingly addressing ethical and social problems related to land management; environmentally sustainable supplies of energy and geo-resources; pollution reduction and its impacts on health and the climate; risk mitigation and communication; geoeducational strategies; research integrity and professional deontology; relationships among geoscientists, politicians, the mass media and the public; and the value of geodiversity, geoheritage and geoparks. Geoscientists with greater awareness of their ethical responsibilities will be better able to put their knowledge at the disposal of society, by spreading the value of geosciences, especially among the young. 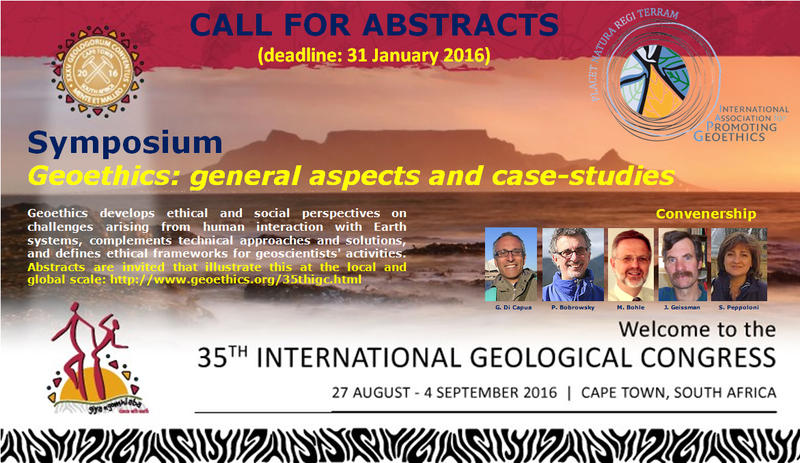 The conveners invite abstracts on both practical and theoretical aspects of Geoethics, including case studies. The aim of the session is to develop ethical and social perspectives on the challenges arising from human interaction with natural systems, to complement technical approaches and solutions, and to help to define an ethical framework for geoscientists‘ activities. Vorheriger Beitrag Are we getting it right? Possibly, yes in most cases.